Washington, DC, wedding photography is both a science and an art. Taking beautiful pictures requires mastery of lighting, composition and camera settings. At the same time, memorable marital photos need emotional depth and impact. In our experience, balancing these elements can be challenging. We have found that those two sides of marriage photography are sometimes at odds with one another. At times, making a shot technically correct robs the image of depth and personality. Similarly, an emotionally powerful moment on a wedding day can take place in atrocious lighting. The best DC wedding photographers are those who find ways to bring the two elements together seamlessly. Neither the science nor the art should suffer at the other’s expense. That is the ideal, at any rate. In the real world, not every situation allows for such a marriage of science and art. Sometimes the circumstances are just not perfect. That is especially true when it comes to the technical side of things. As we mentioned above, lighting in particular is not always exactly what a photographer would want. Many houses of worship are not lit with photography in mind and do not allow artificial lighting during marriage ceremonies. In those cases, we compensate by focusing more on the emotional components of the scene. An image of brides and grooms exchanging their marriage vows can be powerful even if the technical aspects are not perfect. Wedding days are unpredictable in those ways, making it sometimes harder to marry the science and art seamlessly. One of the nice things about engagement shoots is that it is almost always easier to achieve that. The reason is that DC wedding photographers have much more control over the scene. There are generally no restrictions on what a photographer can do to make things look and feel perfect. They can use flashes and other equipment to change the lighting and shadowing. That can turn a technically problematic image into something that checks all the boxes for a great photo. The control that a Washington, DC, wedding photographer has in an engagement session also allows them to stretch the bounds of creativity. They can take risks and tell the love story of the fiancés in new and unique ways. They can eschew the “safe” shots in favor of images that dazzle the eye and redefine beauty. They can frame the spouses-to-be in ways that convey the depths of their emotions. They can create scenarios that allow the fiancés to show why they are joining one another at the altar. 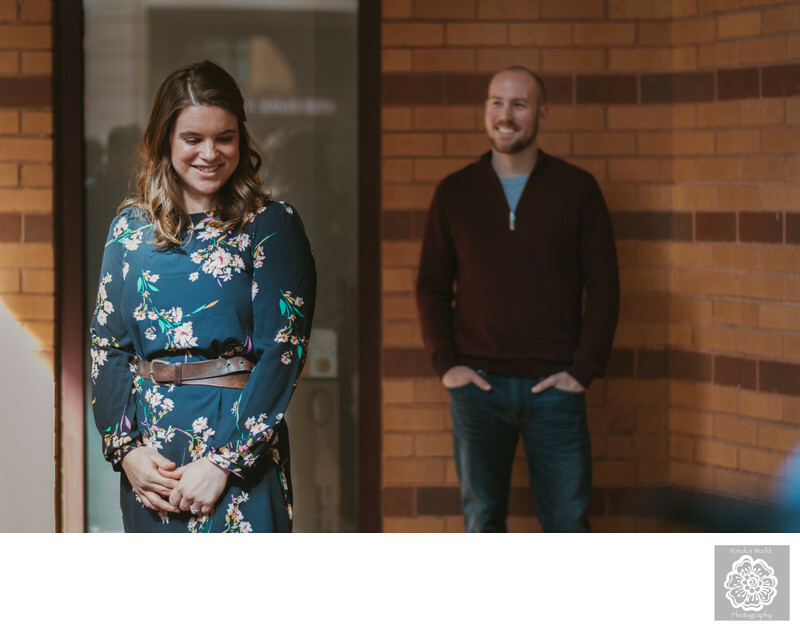 We used some of those creative techniques during this engagement shoot in the DC suburb of Alexandria, Virginia. More specifically, we used posing and our camera aperture to create particularly striking visual effects. Regarding the positioning of the couple, we eschewed a typical pose in favor of something more dramatic. Instead of having the spouses-to-be embrace, we placed the future groom a few feet behind his bride. That distance made the scene much more interesting.We obviously did not want them to seem like two strangers, though, so creating a connection was a priority. To achieve that, we asked the bride-to-be to look down and to the side. This gave the impression that she was aware that her future husband was looking at her. Her shy smile completes the effect. As mentioned above, we also adjusted our camera aperture to add another dimension of depth to the picture. By opening said aperture to nearly its maximum width, we gave the image a narrow range of focus. More specifically, only the future bride was sharp in the photograph, whereas the groom was blurred. This photographic technique was crucial to creating a story in the picture. The viewer’s eye is naturally drawn to the bride first. Not only is she in the foreground, she is also completely in focus. That is exactly what we want to happen. She is the center of attention in this picture. There is more going on, however. She is not alone in this scene. Her gaze — thanks to the aforementioned posing — directs us to the next part of her story. There is a man standing behind her, a man who loves her and who will soon be marrying her. Her future husband is there smiling at being in her presence. Location: 1800 Diagonal Road, Suite 600, Alexandria, VA 22314.